My cookbooks adorn a prime space on our bedside table.Hubby sometimes finds it funny that I read cookbooks and that too so enthusiastically.Since I never stop buying cookbooks and never intend to do so,I have truckloads of new recipes to read always.I glance through each of them and keep ticking away those which I want to try ASAP.Bookmarking so many recipes from blogs too,I am confused as to where to start. Nita Mehta’s Cakes and Cookies was one of my first Baking cookbooks.I took baby steps in baking following her recipes.Simple beginner recipes which yields perfect results.Some of the recipes I tried are here,here and here. Grease and line a 8’- 4’ loaf tin. Preheat oven to 150 C/300 F.
Sift together flour and baking powder and keep aside. Keep aside a few cherries and almonds for the topping and mix the rest with the sifted flour. Beat together powdered sugar and eggs till frothy. Add oil gradually and keep beating. Add the flour-mix to the egg batter,beat well. Then add the essence-scrape the bowl and mix well again. [the batter is quite thick]. Pour into the prepared tin and bake for an hour[or till a toothpick inserted comes out clean]. If the top is browning too quickly,loosely cover the top with a foil. Remove from oven,let it cool for 10 minutes and then remove to a wire rack. looks fabulous divya.... havent baked in ages, this has me craving for some!! Divya, the cake looks really delicious. i love cakes with fruit and nuts...this is good combination. Divu, this one looks super moist n special especially being butterless! :D And co-incidently me too has a bottle of one-time used almond essence n didn't think it did any value addition to the end product! :D LOL on bedside table stacked wt cookery books..does it also mean addition in purchase of new cutlery? :D ;) just kidding! (wd get a new oven by tom. here.wd bake this too!)TC! Tks for sharing. Thanks all of your for your lovely comments. Raaga,guess dried cherries should work fine too.Looking forward to your version;). Looks fabulous.I too have the same book and seeing this,I think I too should try those recipes.I am always postponing things. This cake looks like some pro baked it, really Divya, it's gorgeous! The cake looks yum & very moist too!! Nice pic!! Oh my!that cake looks beautiful.Last pic is clicked very well! Your Cake looks awesome divya..moist inside..love to have one piece..
first time here..but lucky to taste something sweet..expect me often. Even I have cookbooks in my bedroom!! Loaf looks pretty Divya. Wow simply yum! Hi Divya my first time here and just love your posts.Keep up the good work and do find time to visit my blog and leave me a note so that I will know u were there!!! Ist time here Divya, u have got an awesome space dear! 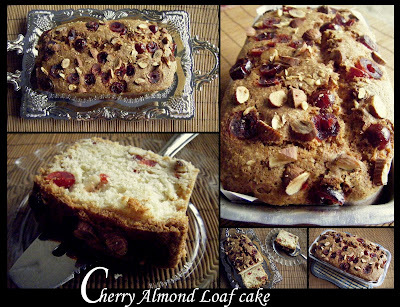 The cake has come out fantastic, so moist and delicious combinations of cherries and almonds, keep rocking!